In all the time I’ve been designing gardens, I have never had anyone tell me, “please, no heathers!”. Thank goodness, because heathers are my secret weapon for extending any season’s interest. By the end of summer many perennials have stopped blooming, but the winter bloomers and fall colors haven’t started in earnest to continue the show. 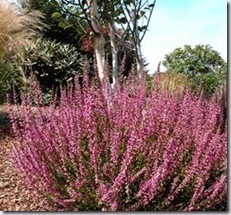 If you’ve got some autumn bare spots in your garden, how about tucking a few heathers into the foreground? 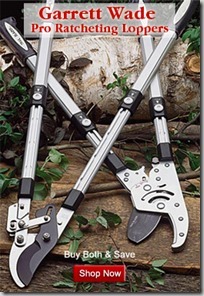 They even work in seaside or deer gardens. 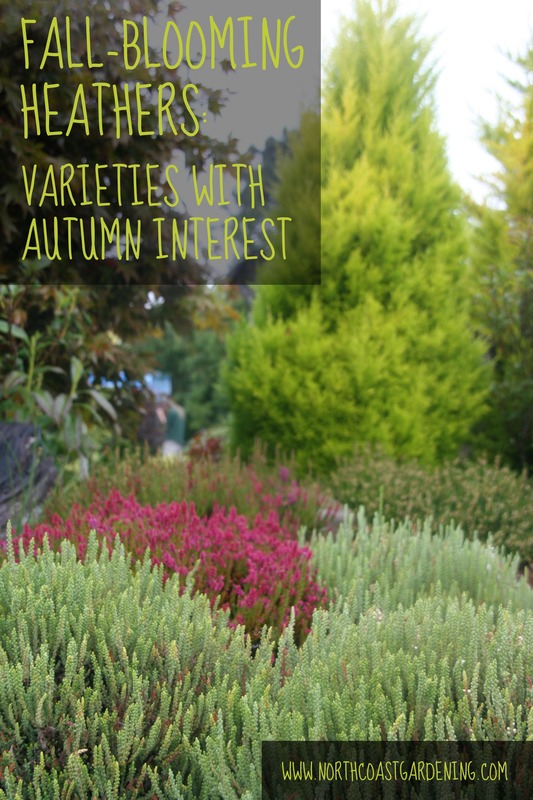 Most of the Scotch Heathers are amazing from August to October, so if you need some late summer/ early fall interest, you can choose just about any Scotch Heather/ Calluna. Some favorites are ‘Japanese White’, which not only blooms white but also brings some spring interest with bright white new-growth in spring (‘Spring Cream’ is similar); ‘Sister Anne’, a low-growing pinky-lavender bloomer with a particularly nice foliage color; and ‘Velvet Fascination’, a feathery grey-leaved one with white flowers that I love to pair with other greys and silvers in the garden (it looks fantastic with ‘Silver Frost’ Lavender nearby!). 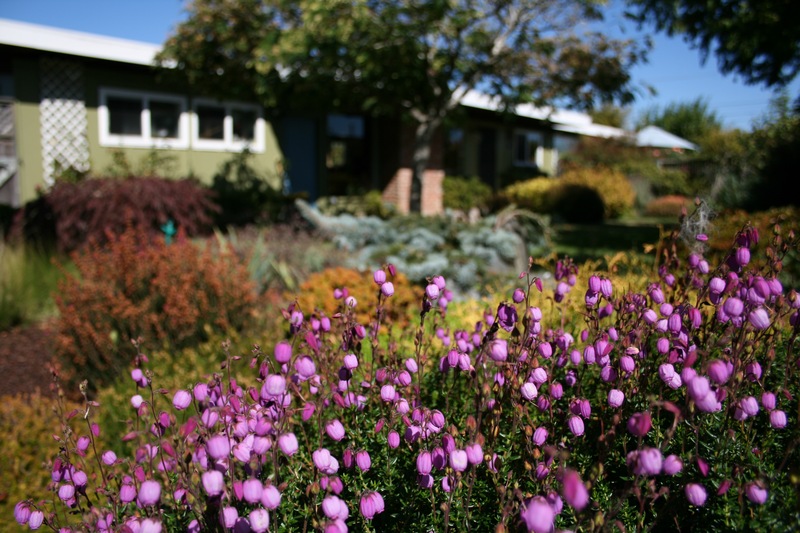 To extend your blooming season further into the fall, Calluna vulgaris ‘Finale’ (click photo to see larger) is one of the last Scotch Heathers to bloom, going in October and November. 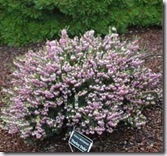 It gets to 2’ by 2’ and has really pretty deep green foliage and pinky-lavender flowers. Bud-bloomers like Calluna vulgaris ‘Roswitha’ have a much longer blooming season since their buds never actually open! The buds are prettily colored and hold their color much longer than flowers do, giving you a great display through fall. Erica darleyensis x ‘Darley Dale’ starts in November and keeps going through February, with pinky-white flowers and a compact habit. 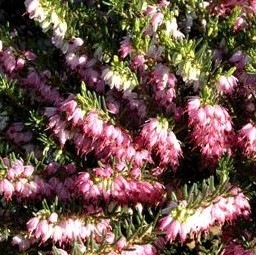 Erica x griffithsii ‘Heaven Scent’ is a more upright heather which blooms July through December with lightly fragrant pink flowers. Erica darleyensis x ‘Ghost Hills’ is a relative of ‘Darley Dale’ with richer pink flowers and creamy white new growth tips in spring. ‘Ghost’ blooms from November to May. My local Heather guru Maria Krenek gave me the tip that many Daboecias (pronounced duh-bee-shuh) can be encouraged to extend their blooming season later into the fall with a mid-summer shearing. Daboecias begin blooming in spring and keep going till early fall, but she says that in mid-summer when they begin looking a little shaggy with all their deadheads, we should shear off the dead flowers and trim into the foliage just a bit, and they’ll be back to finish out the season with more cheer. There are lots of awesome varieties of Daboecia ranging from crisp white to pinks and lavenders. I love how their blooms are larger than the blooms of most heathers, and they have such a good long season. Daboecia cantabrica ‘Waley’s Red’ is one nice choice, with Bright! Pink! Flowers! 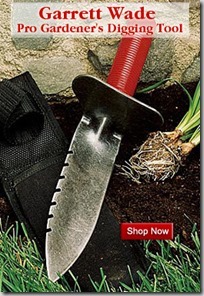 that look great perking up a garden bed. I’m also a sucker for the rich green with white of Daboecia cantabrica ‘Alba’, an easy-to-find Irish Heath that mingles well with other plants. If you love Heathers too, you should definitely check out the new book by Timber Press called Gardening with Hardy Heathers. Maria told me about this book in spring and I was so glad to find out about it, because I’d been struggling along with some well-intentioned but not very good heather books before this one came out. 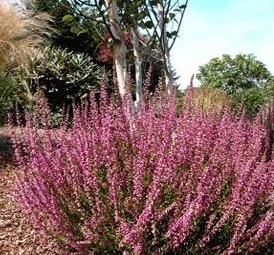 You might also enjoy my video post on How to Prune Your Scotch (and other) Heathers, or this article about the three different kinds of heather and when to use each. Special thanks to Don Wallace of Singing Tree Gardens nursery for use of many of the photos on this page. Hi Maria! I’d click on the links within the post to the International Heather Society and the book by Timber Press on Heathers. Great resources both! We are redoing our front landscaping (new curb appeal). It seem that I am either late in getting winter heather or there is a shortish of them since we are starting in late July. Is there another plant that you can substitute this with that will provide the pink flowers. Coleonema, or Teucrium. . . but they do not flower in winter. 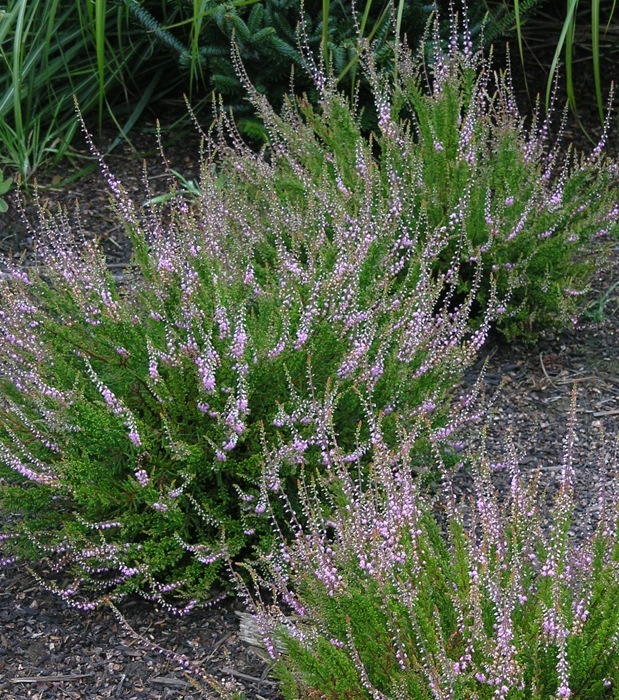 I have just purchased three calluna heathers. and want to know how late in the fall do i cut them back. they are small plants and wonder if I need to trim them this year.